David Burge worked as a mechanical draftsman for a number of years before deciding a sea change was in order. 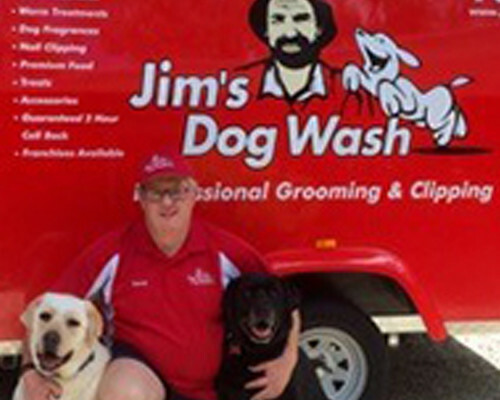 It wasn’t until his mother-in-law jokingly suggested he wash dogs for a living that he found his true calling. With an innate ability to bond with animals it quickly became clear that David could turn his love of dogs into a career. The decision to join the Jim’s family was an easy one. With a reputation second to none and only a minimal presence in Adelaide, David knew this was where he could make his mark by caring for the dogs in his community. Just like us, our pets need regular grooming to ensure optimum health and physical wellbeing. With this in mind David offers a complete mobile grooming service ensuring a safe, comfortable, and rewarding grooming experience for your pooch. Located in Coromandel Valley with his wife and two fur kids, David aims to give his four legged customers the superior care and attention any best friend deserves.